A spirit is a terrible thing to waste. Stephen Jurgens has always gone his own way, both professionally and personally. 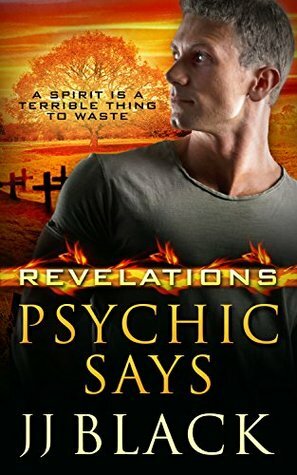 Disowned as a child by parents who did not approve of his gifts, Stephen struck out on his own and, along the way, became a highly sought-after psychic. Between his own private clients and the consulting work he does for Revelations, business has never been better. If only his love life was meeting with as much success. Despite his efforts to reach out and enjoy the dating scene, his heart remains drawn to only one man—Maddox Blackwood. Alpha of the Pontiac wolf pack, Maddox Blackwood is the only man Stephen has ever met who has the power to destroy him. Their initial meeting led to a rejection of epic proportions that left Stephen wary of any kind of romantic entanglement. Now, eight years later, Maddox is back and ready to claim Stephen as his own, as he should have done all those years ago. The only question is, can Stephen find it in himself to forgive the past and accept the future Maddox is offering? All thoughts of mating are put on the back burner when Revelations receives a call for help from a local cougar pride. People are dying, but are their deaths as mundane as they appear or is something more nefarious plaguing the Pride lands? With their investigation underway, Stephen and his team soon discover that things aren’t always what they seem, and just because you don’t see something, doesn’t mean it isn’t hunting you. This is Book 2 of JJ Black’s Revelations series and I liked it better than the first one. Here we have Stephen, who was mentioned in book 1, the man who helped train the Oracle and helped him out a lot. Anyways, Stephen can talk to dead people and is more powerful than he actually thought. He’s a Shaman. Maddox is an alpha for a wolf pack and is Stephen’s mate. They’ve both been circling each other for years until Maddox made the first move. Poor Stephen didn’t want to believe that they were mates cause someone fooled him before, but who can resist Maddox? Seriously, the man is red hot. lol. I liked the story build up and the bad guy was actually interesting. I wish there were more scenes with just Maddox and Stephen so I’m hoping this won’t be the last book about them. They’re a really interesting couple. I liked that Stephen wasn’t some hunk in his twenties. He was actually an older man while Maddox was the younger one. Born and raised in Western Michigan, JJ Black’s love affair with books started young and has only grown with age. Always a fan of supernatural fiction and romance, JJ stumbled across the M/M genre and has never looked back.